This page is about the German medium tank M48A2 G A2. For the version in the American tree, see M48A1. The M48A2 G A2 is a Rank V German medium tank with a battle rating of 7.7 (AB/RB/SB). It was introduced in Update 1.81 "The Valkyries". Describe armour protection. Note the most well protected and key weak areas. Appreciate the layout of modules as well as the number and location of crew members. Is the level of armour protection sufficient, is the placement of modules helpful for survival in combat? If necessary use a visual template to indicate the most secure and weak zones of the armour. Write about the mobility of the ground vehicle. Estimate the specific power and manoeuvrability as well as the maximum speed forward and backward. 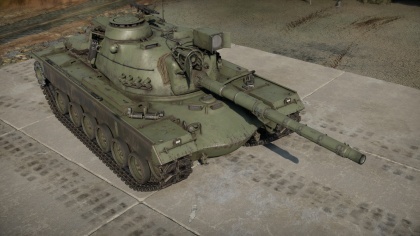 The M48G2 G A2 wields the widely used 105 mm L7A3 cannon, which provides fast, accurate fire. This tank has access to a APDS shell (DM13), HEAT-FS shell (DM12), and a HESH shell (DM502). Ammo racks of the M48A2 G A2. Some tanks are armed with several guns in one or more turrets. Evaluate the additional weaponry and give advice on its use. Describe the ammunition available for additional weaponry. Give advice on how to use them and how to fill the ammunition storage. If there is no additional weaponry remove this subsection. Offensive and anti-aircraft machine guns not only allow you to fight some aircraft, but also are effective against lightly armoured vehicles. Evaluate machine guns and give recommendations on its use. Fairly good upper glacis armor. Highly effective 105 mm gun is a noticeable upgrade from the 90 mm gun on the M48A1. Frontal turret armor is not very effective; don't rely on it to protect you. Commander's cupola is still a large target. Can't deal with enemy aircraft as effectively due to the deletion of the .50 cal. Describe the history of the creation and combat usage of the ground vehicle in more detail than in the introduction. 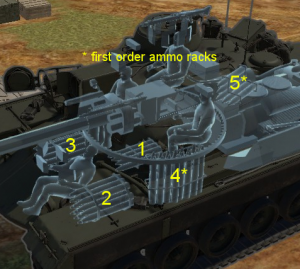 If the historical reference turns out to be too big, take it to a separate article, taking a link to an article about the vehicle and adding a block "/ History" (example: https://wiki.warthunder.com/(Vehicle-name)/History) and add a link to it here using the main template. Be sure to reference text and sources by using <ref>, as well as adding them at the end of the article. M48A1 - Basic M48 version that the M48A2 G A2 was upgraded from. 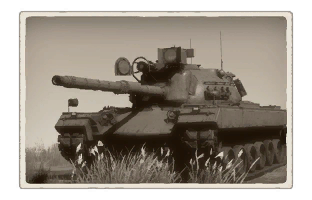 Magach 3 (USA) - A similarly upgraded M48 tank from a pack in the USA tech tree. This page was last edited on 19 March 2019, at 19:25.